From 22nd-25th June, Cork Printmakers presented FIRST EDITION - A Print Symposium at Millennium Hall with a theme of: Multiple Dimensions: Exploring Printmaking as an expanded practice in contemporary visual culture. PRINTS are built to travel, to be shared, to convey thoughts and ideas and styles from one place to another. These were the words of keynote speaker Susan Tallman, Editor in Chief of Art in Print, reminding us that prints do not make themselves, and importantly, printmakers do not work in isolation. The need for studios complete with huge and heavy equipment meant that access to print workshops immediately became an integral part of the print industry infrastructure. The model therefore differs from other visual arts professions - not one artist to one agent, buyer or audience, but many artists working collectively to attract many (even if only to justify the costs of running such large studios). As a direct result, Tallman states, the social nature of the 'shared space' has meant that print workshops retain fluidity across a wide range of uses, from community and education programmes to professional art creation - a characteristic that is still very apparent today. If there was one take away thought from the print symposium, it was from Tallman, that prints are, by their nature and design, cosmopolitan, portable and permeable. Highlighting this was a variety of speakers to evidence and underline the 'permeability of print'. Dr Carinna Parraman, Professor in Design and Colour at UWE spoke with great enthusiasm about her current research, from 2d to 2.5d to 3-dimensionsal printmaking, and revisiting the possibilities of RGB screenprinting. 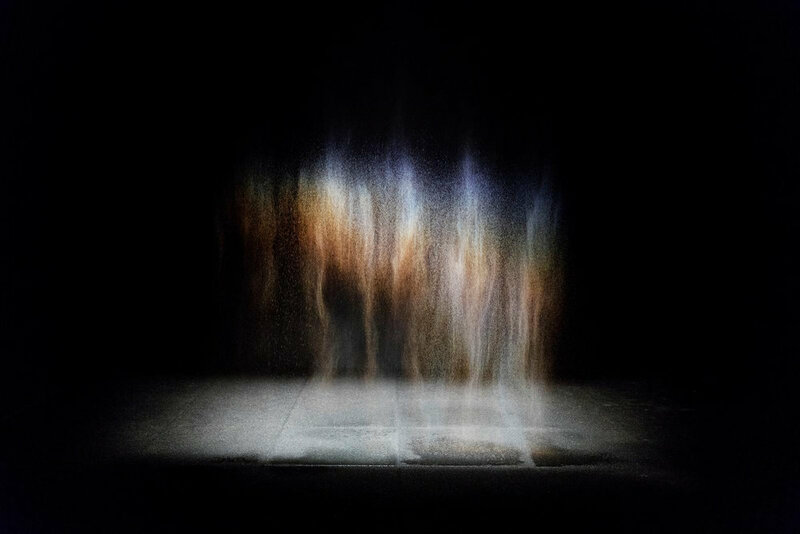 Related to this research, Parraman shared inspiring examples of work, such as Olafurr Eliasson's 1993 piece Beauty, an installation featuring a punctured hose that sprays a curtain of fine mist towards a spotlight beam projected from the ceiling. From certain perspectives, a rainbow can be seen in the falling water; it shifts in intensity or disappears as the viewer moves closer or further away. 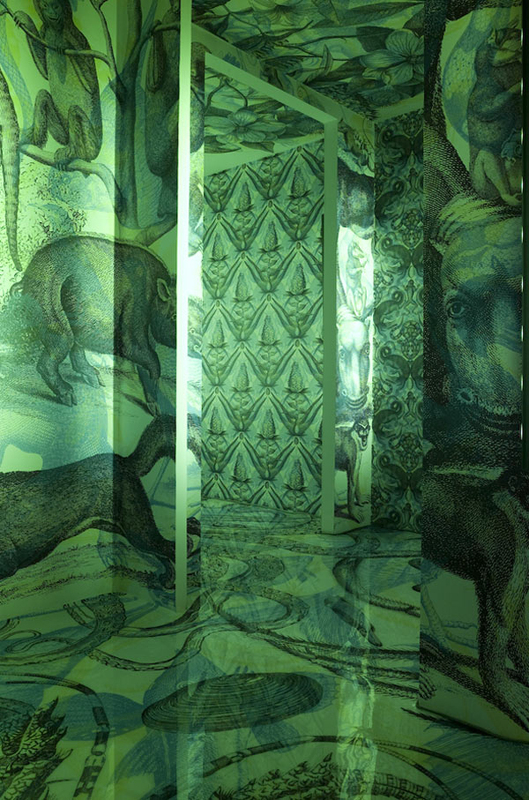 Parraman also displayed Carnovsky's RGB, a project first exhibited in 2010 that experiments with the interaction between printed and light colours. The resulting images are unexpected and disorienting. The colors mix up, the lines and shapes entwine becoming oneiric and not completely clear. Through a colored filter though, it is possible to see clearly the layers from which the image is composed. The filter's colors are red, green and blue, each one of them serving together to reveal and conceal a narrative of archaic symbols. In addition to new methods of display, each of the artworks in the symposium referenced unique technical qualities to be found in their own making. This was demonstrated by printmaker Erik Kok, who spoke about an ambitious project that took over 4 1/2 months to complete. In How To Disappear Completely Kok introduces two people who connect with the outer world in two totally different ways – one engaging with it openly, and the other one turned inwards. Their portrayals are fragmented and printed onto ceramic bowls, installed like oversized pixels. When walking closer, the images disappear as the single fragments become visible. Conceptually and in creation, Kok engages with the historic process behind print, and asks vital questions about where it will progress next. Although too many to document here, other notable presentations included those by academics Angela Griffith and Andrew Folan, artist Emma Gregory and collaborative duo The Project Twins - each demonstrating their passion for print from a variety of backgrounds, speaking of their uses, their research and artistic outcomes. All of these served to present the relevance of printmaking today, and by doing so, the symposium itself exhibited the social nature of printmaking as emphasised by Tallman. As a collection of artists and of print workshops, we enjoyed a truly special offering with First Edition.We think about these artists as setting the bar and widening our expectations of what printmaking can do, where it lies in relation to the contemporary visual arts field, and ultimately contributing to our understanding of medium. As I came away reeling from the sheer amount of information - I couldn't help thinking about the history of the printmakers before us, but also looking forward with anticipation to the works that would come next.